We’d love your help. Let us know what’s wrong with this preview of Wineocology by Caitlin Stansbury. Published November 6th 2012 by skirt! To ask other readers questions about Wineocology, please sign up. All right, here we go. I won this through the Goodreads First Reads program, and there are few things as good as getting a good book for free. And this is a good wine book. I have read other books on wine, and they have largely been a bit dry (pun intended!). Luckily, the author here utilizes a conversational tone when writing, and as such the prose meanders a bit, moving from subject to subject, pausing at points to make a joke or to linger on some more poetic prose and images. 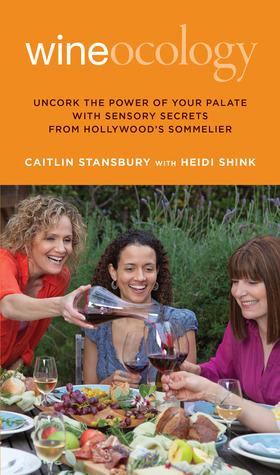 It is effectively done, not putting the reader to sleep while at the same time imparting good information about wine. While this book does feature information on the history and making of wine, though, the more pervasive thrust seems to be trying to teach the enjoyment of wine, the appreciation of wine as accessible to everyone. And that is refreshing, and the book is laid out to help this idea along, breaking up the more informative sections between more conversational ones, never really staying on the hard stuff too long to turn off readers from going farther. For a book on wine this is a fast read, moving right along and keeping attention as it moves from history to advice on how to see, smell, feel, and taste wine. And the book does emphasize this complete approach to wine, making sure to take it in with a full range of senses instead of just taste. It is a refreshing approach, emphasizing the complexity of wine which is one of its greatest virtues. As the author points out, the more complex something is, the more rewarding and enjoyable it often is as well. And so it goes with wine, where really learning to tell the complexities does bring a deeper understanding and enjoyment of drinking wine. And this book is designed to be a guide and companion to actually drinking wine, with sections that can be used to help steer the experience, instructing on what to look for and how to tell a Malbec from a Pinot Noir. And the design mirrors this by having faux wine spills on the page, leading one to think of the book as something that shouldn't just sit on the shelf, that should be accompany drinking and trying to figure out what wines are and where they were produced. The second section of the book details a system by which anyone should be able to learn how to experience and identify wine, and it does seem a solid system, simple and more based on paying attention to things that we normally just gloss over. The book does have a few little things that I wasn't a huge fan of, though. Most pervasively is that the author is writing more to a female audience, which isn't that bad but does sort of play into those stereotypes and while it wasn't really annoying I did find myself rolling my eyes a few times at some of the jokes and anecdotes. It's not that bad, just that as a man I felt that she was thinking of more traditional gender roles when she was writing. The third section, too, which contains pairing wines and food, was a bit vague and seemed much more inconsistent than the rest of the book. On the one hand, it does end the book with recipes and pictures, which is nice after the heavier prose, but at the same time it tries to codify wine pairing with food that really is full of exceptions. The recipes doesn't all follow the guidelines she sets up, so it's hard to get much out of that section. The recipes look delicious, it's just that the third section doesn't quite live up to the first and second, which are much more straight forward and easy to understand. "The more enticing a plant can make its fruit, the more likely it is to be gobbled up, seeds and all, by free-wheeling creatures, who will later distribute said seeds, along with a perfect load of growth-starting organic fertilizer, in some far-flung location." Yes, you read that correctly she just made a bowel movement sound like a lyrical dance number. A different kind of wine book that takes an educational approach to make any wine drinker a better educated and more aware wine drinker. By using all of the senses that every individual uses on a daily basis, Stansbury brings wine to the people to allow for everyone to learn a new way to approach wine and enjoy it at a fuller level. I appreciated the writing style. Very practical advice.